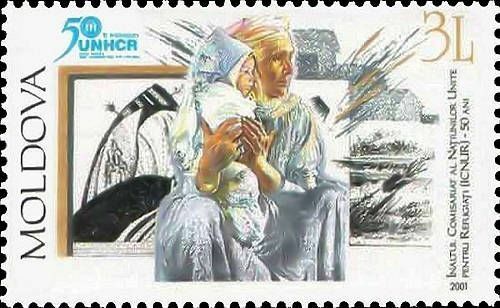 On 19 January 2001, the Post Office of Moldova (Poșta Moldovei) issued a postage stamp with the title 50th Anniversary of the United Nations High Commissioner for Refugees. The issue comprises one stamp, with an associated cancellation (postmark) and first day cover (FDC). The designer was Ivan Picev. The printing was performed by Bundesdruckerei, Germany. The Office of the United Nations High Commissioner for Refugees (UNHCR), also known as the UN Refugee Agency, is a United Nations agency mandated to protect and support refugees at the request of a government or the UN itself and assists in their voluntary repatriation, local integration or resettlement to a third country. Its headquarters are in Geneva, Switzerland and is a member of the United Nations Development Group. The UNHCR has won two Nobel Peace Prizes, once in 1954 and again in 1981. Read more.. This article uses material from the Wikipedia article 'United_Nations_High_Commissioner_for_Refugees', which is released under the Creative Commons Attribution-Share-Alike License 3.0.